Presented at Innovation in Pedagogy and Technology Symposium, University of Nebraska, May 8, 2018. Over the past two years, UNO has increased the number of online course selections by nearly 50 percent, offering seven fully online undergraduate programs, seven fully online graduate programs, and an assortment of online minors, certificates, and endorsements. 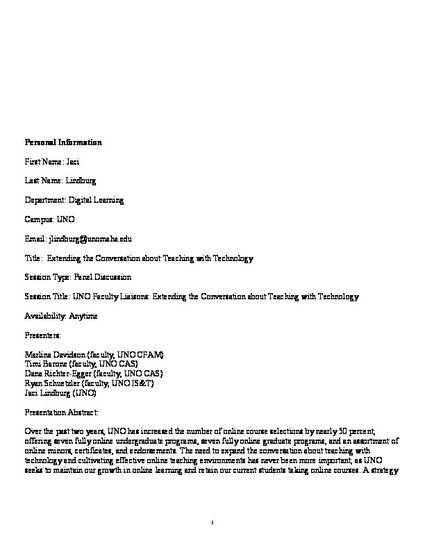 The need to expand the conversation about teaching with technology and cultivating effective online teaching environments has never been more important, as UNO seeks to maintain our growth in online learning and retain our current students taking online courses. A strategy introduced in 2017 that has been extremely effective has been the Faculty Liaisons for Instructional Design Program, co-sponsored by the Office of Digital Learning and the Senior Vice Chancellor for Academic Affairs. Liaisons work regularly with UNO Instructional Designers, Instructional Technologists, and Digital Learning Administrators to pilot emerging technology, provide feedback on technical transitions and messaging to faculty, represent fellow faculty’s experiences and concerns with systems and tools, lead college-specific programming initiatives, and host a campus-wide teaching with technology showcase. This session will provide an overview of the liaison program and feature a panel discussion from four liaisons who will share key strategies they have employed to work across their colleges to support and engage with fellow faculty.